The bulk of the damaged F-22s may be training units. A significant proportion of the total F-22 Raptor airframes available to the United States Air Force were damaged at Tyndall Air Force Base in Florida during Hurricane Michael. According to the U.S. Air Force, as many as 17 F-22 Raptors may have been significantly damaged or destroyed in the hurricane. The F-22 Raptor is a single-seat, fifth-generation stealth air superiority fighter, widely considered to be one of the most capable military aircraft ever built. The Raptor is no longer in production. The U.S. Secretary of the Air Force Heather Wilson, General David Goldfein, the chief of staff of the U.S. Air Force, and Chief Master Sergeant of the Air Force Gen. Kaleth O. Wright visited Tyndall to take stock of the damage on Sunday. 55 F-22s are based at Tyndall with the 325th Fighter Wing’s 43rd Fighter Squadron and the 95th Fighter Squadron. The 95th Fighter Squadron’s 24 F-22s are combat-coded and operational. The 43rd Fighter Squadron’s 31 F-22s comprise the primary training unit for the Raptor. As of May 2018, the U.S. Air Force had 186 available F-22 Raptor air frames in its inventory. With potentially 17 out of commission due to damage or destruction, nearly 10 percent of the remaining F-22 inventory was affected by Hurricane Michael, which was the third-most intense Atlantic hurricane to make landfall in the United States in recorded history. According to the New York Times, the U.S. Air Force reacted before the storm to divert some F-22 units away from Tyndall Air Force Base, anticipating damage from the hurricane. “Before the storm, the Air Force sent at least 33 of the fighters to Wright-Patterson Air Force Base in Ohio,” the Times reported. It’s unclear which specific units were left behind at Tyndall AFB. Given the diversion of 33 F-22s, it appears that nearly all of the remaining fighters suffered some damage in the hurricane, which made a near-Category 5 landfall, coming in far stronger than its expected Category 3 intensity. As Tyler Rogoway has explained at The Drive, the considerable maintenance and support required for each F-22 airframe meant that a complete evacuation was implausible. Apart from the 33 fighters that were sent to Ohio, the remainder may have been in various states of hardware and software maintenance, making it impossible for them to fly away prior to the hurricane’s landfall. The F-22 Raptor has a reputation for needing considerable maintenance and repair per flight hour. 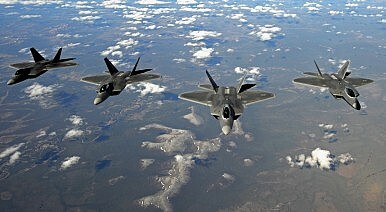 The U.S. Air Force found earlier this year that “less than half [of all F-22s] are mission-capable” at any given time. Depending on the precise damage and destruction suffered by the F-22s at Tyndall, the total cost may come out to more than $2 billion. The damage underlines the threat posed by nontraditional threats from extreme weather events in and around the United States as a result of climate change. Update: In a statement Sunday evening, Wilson noted that “Damage was less than we feared and preliminary indications are promising.” The damage assessment is still ongoing.